The African Pipit (Anthus cinnamomeus) is a fairly small passerine bird belonging to the pipit genus Anthus in the family Motacillidae. 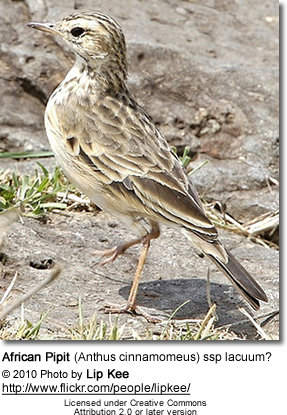 It is also known as the Grassveld Pipit or Grassland Pipit. It was formerly lumped together with the Richard's, Australasian, Mountain and Paddyfield Pipits in a single species, Richard's Pipit (Anthus novaeseelandiae), but is now often treated as a species in its own right. It occurs in grassland and fields in Southern, Central and East Africa, south-east of a line from Angola through the Democratic Republic of the Congo to Sudan. It is also found in south-western Arabia. There is an isolated population in the highlands of Cameroon which is sometimes considered to be a separate species: Cameroon Pipit (Anthus camaroonensis). The African Pipit is 15 to 17 cm long and is a slender bird with an erect stance. It is buffy-brown above with darker streaks. The underparts are white or pale buff with a streaked breast and plain belly and flanks. The face is boldly patterned with a pale stripe over the eye and a dark malar stripe. The outer tail-feathers are white. The legs are long and pinkish and the slender bill is dark with a yellowish base to the lower mandible. Juvenile birds have a blotched breast, scalloping on the upperparts and some streaking on the flanks. The Cameroon Pipit is slightly larger and darker with buff underparts. The song is a repeated series of twittering notes, given during an undulating song-flight or from a low perch. BirdLife International has lumped the African Pipit with Richard's Pipit, and therefore has given it no separate conservation status. 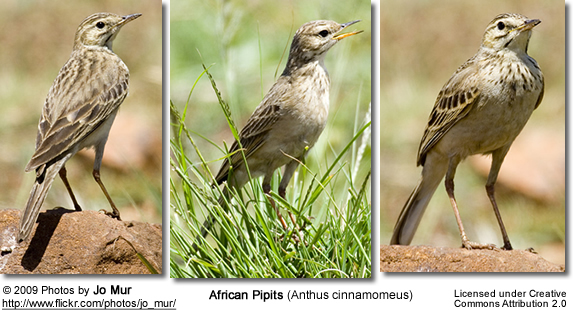 However, Zimmerman, Turner, and Pearson (1999) call it "the common East African pipit."